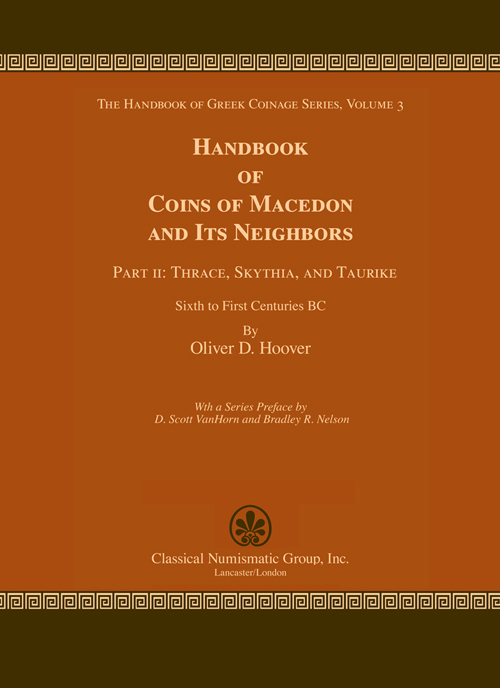 The tenth published volume in the series is Handbook of Coins of Macedon and Its Neighbors. Part II: Thrace, Skythia, and Taurike, Sixth to First Centuries BC (the second part of Volume 3 in the series). This volume, picking up where Part I leaves off, is arranged first with the cities, beginning with Thrace, followed by Skythia and Taurike. These issues are then followed by dynastic and royal coinage, beginning with Thrace, followed by Skythia and Taurike. Civic coinage is arranged chronologically, beginning with the Archaic issues and continuing through the later civic issues. Where rulers or cities issued coins concurrently in all three metals, these issues will be arranged in the catalog with gold first, followed by silver, and then bronze; each metal is arranged by denomination, largest to smallest.